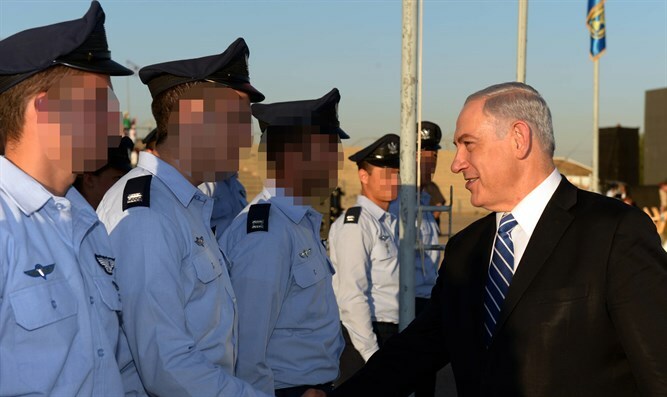 Israeli Prime Minister Binyamin Netanyahu on Thursday night attended a military event at the Hatzerim Air Force Base. In addition to Netanyahu, Israeli President Reuven Rivlin, Defense Minister Avigdor Liberman (Yisrael Beytenu), IDF Chief of Staff Gadi Eizenkot, and Air Force Commander Amikam Norkin also attended the event. “Today, the Air Force is stronger than ever, and we equip it with the best weapons and technology, and above all else, with the best people in Israel. “We blew up Iran’s cash machine. The ones who provided the most cash to Iran were stopped short, and the Iranian people are feeling it in their pockets. The IDF, and the Air Force, will continue to act with force against Iranian targets in the area. Praising the Air Force, Liberman noted the current push to reconquer Gaza. “As Israelis, we are impatient. We want everything immediately, right now: A war now, victory now. But a serious and responsible defense policy cannot give in to media or public pressure. The State of Israel is dealing with many challenges and threats, in both the north and south.